When the sun goes down the streets of East LA come alive with taco activity. Outlaw taco carts set up on the sidewalks in front of auto shops,parks and discos and grill everything from carne asada to chorizo to al pastor. I found one such taco cart at 3889 E Cesar Chavez Blvd(corner of gage and cesar chavez)and rubbed elbows with all walks up life from businessmen in suits, to gents in cowboy hats and youths in baggy shirts and attitudes. Al pastor was the star of this outlaw taco cart(as it is with most). A hunk of glazed pork on a spit twisted in front of a fire while the cook cut slices of pork from the spit on to the grill. The pork sizzled next to grilled onions and the magic began. 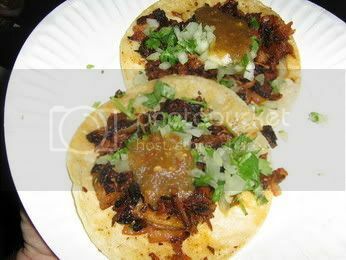 Two soft corn tortillas soaked up the pork grease as the cook scooped the sizzled charred al pastor and carmalized onions into the taco and on to the plate. I attempted to take a photo of the al pastor spit and other meats that were grilling but the women collecting the money looked at me and motioned not to do so. This is understandable considering these taco carts are illegal and probably violate every health code known to man. That's not saying any of the fare isn't fresh,it most likely is as fresh as your average daylight taco truck or more so. I drizzled some salsa and onions and cilantro on my tacos and after the first bite I'm taken to a place I've never been before. The taste of the charred pork and carmalized onions and the sweet bite of the salsa is not one I've had . I've had my share of al pastor but this al pastor was on another plane. It was amazing. This is what this taco hunt has been about. Finding these taco havens and becoming a more savvy taco eater in the process. Sometimes the city moves so fast that we need these occasions to soak in the night and slow it down with a plate of tacos on the sidewalk with the sound of salsa music blaring out of a nearby disco. This is why Los Angeles is a taco town. Bro ... 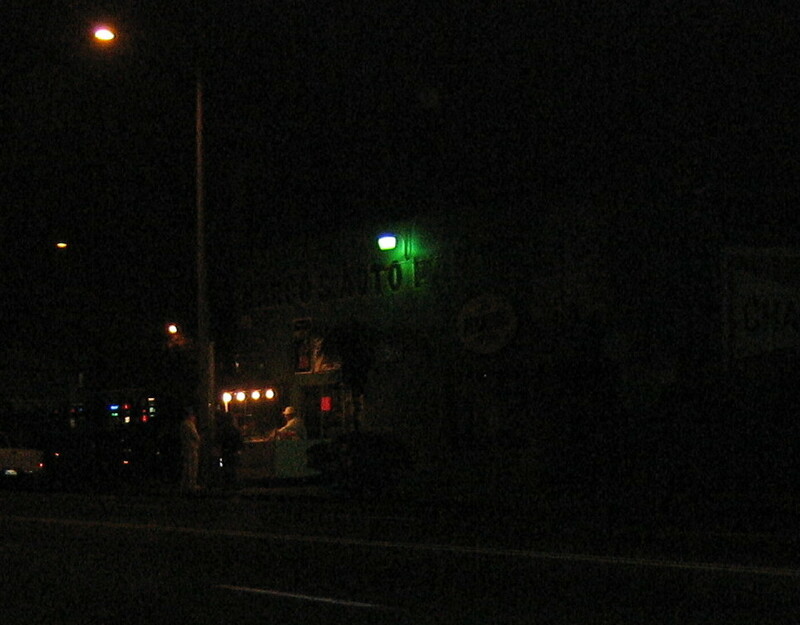 I would recommend that you try Taqueria Sanchez on Centinela on the Westside. It is just north of the intersection of Culver Blvd. and Centinela. It is rumored to be the best taco joint on the Westside of LA. reviewed Taqueria sanchez. It's in the archives. Not a big fan but I'm going to go back and give it another go. If you want a good taco truck and don't mind driving to E.L.A., try Olympic & Herbert Ave. about 3 blocks west of the King Taco off Olympic & the 5 Fwy. Tacos "EL Korita" Taco Truck. $1.00 full Size Tacos. Not those $1.25 two bite mini tacos. Check it out. you won't be disappointed. I don't know if this is the same truck, repositioned, or another truck by the same family/group, but there is a Tacos El Korita truck that is positioned most afternoons, and evenings on Orme Ave, just south of Olympic, a block east of Soto. I discovered this truck a few months ago and it has pretty much become my hands-down favorite. The pastor is a bit bland, but all the other meats, particularly the carnitas, are to die for. The fresh tortillas are very good, and they also make sopes, tortas, and huaraches. One thing I like is that when you order a burrito, they give it to you to top with salsa, onions, etc before taking it back to wrap, so you can get it just he way you like it. I think there *was* an outlaw guy in the Westlake area near Macarthur Park, on 7th, east of the lake, next to the Thai massage building / swapmeet, in the alley. The "cart" was a grocery cart, and the setup was kind of camoflauged. The man made some awesome tripas. It went from the grill to your face in less than a minute. He was totally clean too -- clean clothes, the grill was sparkling, good meat, all on the DL. All kinds of people came by, especially from the offices. This was several years ago. This was a week ago from this past Saturday.......maybe they moved up 1 block to not make such a scene. It was about 9:30 P.M. . I used to work at the Target in East LA. This truck would pull up at around 5 on the corner of Whittier and Hoefner. It's still there every night and when I'm dying for a really good carne asada burrito or an al pastor taco con todo, this is it! On weekends the truck is packed with customers and it takes about 20 minutes to get your food. It's well worth it! Where is this truck? Late night at 7 pm (April 13, 2007), I drove down Cesar Chavez, looking up and down side streets, but never saw anything that looked like this truck (or a line waiting at a truck). Does anyone know its location these days? I instead went to the Cesar Chavez King Taco, where I was disappointed. The salsa rojo was blistering hot, but neither the salsa nor the carne asada and pastor were as flavorful as at the other King Tacos I've tried. I was very disappointed. found this place accidentally on the way back from Irvine with my buddy from Minnesota. easily the best Al Pastor either of us have ever had. The guy from minnesota ordered 4, ate them, then got another 2.
also - this isn't a truck for those looking for one. It's a stand like Kyke's on 2nd street. look for the pastor Spit! I recommend you try this truck in Eagle Rock on Colorado Blvd a 1/2 blk. West of Eagle Rock Blvd on the S. side...He serves full size tacos with real guacamole and he uses real Ranchera meat...excellent!! !omly 1.25 ea. and the Burritos are good too,with frijoles de la joya. I sell Taco Carts @ $450 it comes with a 20 x 20 Grill and a 3 compartment Steamer. It comes with the Propane Hose but no Tank. The legs come off and can fit in the trunk of of my beat up ford.